It’s not easy being a major fashion designer, you know. 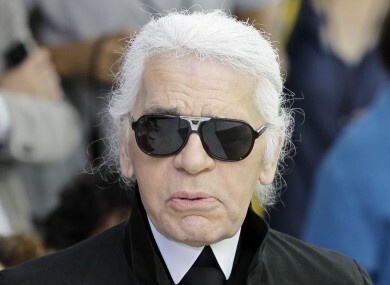 KARL LAGERFELD HIT headlines again recently with his latest bizarre utterance: a stern criticism of Pippa Middleton. Never one to bow to conventional wisdom, Karl told The Sun that while P-Middy’s bottom was an acceptable sight, her face should be kept averted. “I don’t like the sister’s face. She should only show her back,” he said. Swans, they are the meanest animals in the world, you know. I had problems with them as a child. They hate children. I was caught by one, so I know. The idea of swans is lovely, and they have a beautiful shape, but they seem more romantic than they in fact are. I wear jeans; at the moment they are from my new collection. They are dark gray with my face, my profile, printed in black on them, but you really have to look at it to see it. When I was four I asked my mother for a valet for my birthday. I actually have two houses. This house here, it’s only for sleeping and sketching, and I have another house two-and-a-half meters away for lunch and dinner and to see people, and where the cook is and all that. She doesn’t like to eat on the floor, so I have to put the food on the table. Her dishes are by Goyard. She has one for water, one for her little croquette, and one for her pâté. You have to serve everything, and she makes a choice. The iPod is genius. I have 300. Email “6 reasons why Karl Lagerfeld’s life is very difficult”. Feedback on “6 reasons why Karl Lagerfeld’s life is very difficult”.